What I thought was going to turn out to be nothing more than a simple pizza, really wasn't at all. 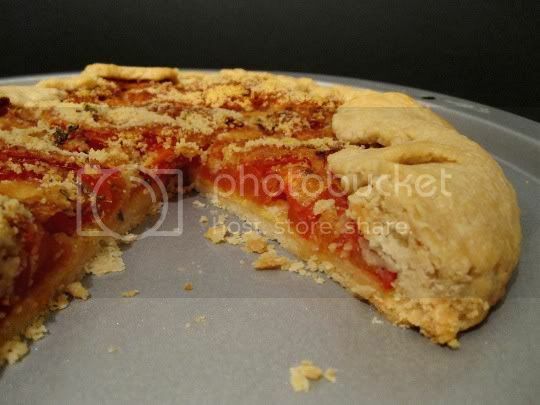 Although this galette (or French version of a free-form tart) was stacked high with tomatoes and cheese and baked until crisp and golden, it was really more of a savory pastry. Prep seems easy, but that proved to be rather deceiving. Although the recipe boasts few ingredients and steps, there are possible pitfalls to watch out for. Making the crust is simple, but be careful when rolling it out, filling it, and transferring it to the baking pan...it's thick but very soft and delicate and will tear easily! Luckily, the consistency allows it to be easily pieced back together if necessary, but still be careful. And while the tomato slicing is simple enough, the recipe throws you off with the amount needed: "5 large tomatoes" is rather subjective, and I ended up using only about 3-4 large Roma tomatoes (which are smaller than the "regular" variety), and STILL had some leftover. Finally, the baking time was completely off, and I needed to bake it an additional 30 or so minutes before the crust even browned. But in the end, the trouble was well worth it. The crust was thick, delicate, and flaky; completely unlike a pizza dough. The tomatoes were roasted until sweet and chewy, but they kept their texture well and didn't get runny or soggy. The generous 1/2 cup of cheese sprinkled atop before baking (I used Romano instead of Parmesan) provided a salty and hearty flavor, without being melty and gooey. I would definitely double the amount of minced garlic and fresh rosemary added: I suppose they were only there to add subtle flavor, but more would have really made this extra flavorful. But the star in this recipe is clearly the tomatoes, and sometimes with food, less is more! Make again? Definitely! More garlic and rosemary, and maybe even experiment with some different or additional veggies (leeks, eggplant, roasted red peppers, etc. ).